The Buddhist festivals or Tsechus are one of the prime examples of the living culture of Bhutan that many have come to admire and to treasure. The Tsechu is a festival in honour of Guru Rinpoche, the saint who brought Buddhism to Bhutan and the Himalayan world. These Tsechus are held in almost every district attracting hundreds of Bhutanese people in a spirit of festivity, celebration and deep faith. The Tsechus have spiritual connotations, and Buddhist practitioners perceive a symbolic communion between dancers and spectators. Those attuned to the faith can feel the spiritual powers evoked by the dancers dressed in elaborate, often ancient, costumes, masks and headgear. Apart from monk dancers, community folk dancers and singers also perform during the Tsechus. 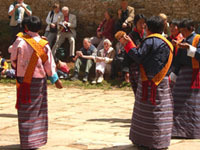 The Bhutanese people consider it a blessing to be able to watch the dances. Tsechus are held on auspicious days, on the tenth day of the Bhutanese month, and last up to four days in which a series of highly stylised masked dance rituals are performed. The dances are well known and loved by the Bhutanese who come dressed in their best for the very special social occasion for all Bhutanese families. Some of these festivals unfurl a giant thangkha known as a throngdel that is usually a silk appliqué and embroidery of a Buddhist saint. The word throngdel means “liberation on sight” and people form long queues to receive blessings by touching their heads against the bottom of the thangkha. This commemorates the opening of the gateway to the pilgrimage site of Tsari in eastern Tibet by the founder of the Drukpa School of Buddhism, Tsangpa Jarey. Tsechus take place throughout the country in every district at different times of the year. The smaller Tsechus are often more interesting as visitors get a close and better perspective of a local festival. The Department of Tourism maintains a list of Tsechus, locations and dates for the year.